If you are a blogger or thinking to start a new blog or you already have a blog but struggling to get engaging readers, you must know about Bounce rate. Bounce rate is an important thing to consider. If your blog receives high bounce rate, you should need to take proper steps. In simple words, reducing Bounce rate means sticking new visitors to stay on your blog longer. If you use Google Analytics, you may have seen this term in traffic reports. If you are not sure about this, you must know it as soon as possible. In this post, we will discuss what is bounce rate and how to reduce bounce rate of your blog. Before you go into detail, check the below image. More bounce rate means fewer page views and less bounce rate means more page views. So, you can assume the importance of bounce rate for a blogger. Bounce rate is the percentage of single-page views of your website in which the visitors left your website from the landing page. It means how many visitors bounce to another website after viewing only single page of your website. If Bounce rate is high, it means visitors are leaving just by viewing the page they landed. This does not sounds good for a website owner. Because visitors went away just from the landing page means he did not find good content on your website. So, You should always try to reduce bounce rate of your website. If you want to earn better from your website, you should always try to reduce bounce rate. Now you know that bounce rate should be as low as possible. Bounce rate depends on various factors including the niche. If you have a news blog, you cannot reduce bounce rate less than 60% because readers will only have an interest in the current story unless they see an eye-catching story. But for another niche, it can go as low as 20%. If you maintain the good blog with quality content, you can easily get the bounce rate of 40% to 60%. In my opinion, this bounce rate is good. In the new blog, you cannot get this kind of bounce rate because if the lack of trust. When I came into blogging, less bounce rate was helpful in increasing page views. But, Google also learned the importance of bounce rate and added it as the main ranking signal. If you are confused, let me explain it in detail. When your blog’s link appear in the search result on good position, people will find it and will visit your website. If they instantly bounce back to Google’s search result page to see another result, Google will count as a negative voting to your website. It is because that specific person was not impressed with your content and went back to see if another page is helpful. For Google, your page was not helpful for that specific query. Google takes similar kind of feedback for all results it shows and person visits. Based on time spent on a specific page, Google decides what page to remove from the first page or decrease the ranking to promote page what the persons liked and spent more time. The high bounce rate you will have, the bad feedback your visitors are giving to Google. So, it is very necessary to reduce the bounce rate and keep your visitors engaging. If they come from organic search and spent a good time on your website, you will surely see improvements in ranking for that specific query. Before I talk about different ways to reduce bounce rate, let me show you a screenshot of a website I own. See that 85.3% a new visitors but I still have 11.01% bounce rate. It means, people visiting the website are liking the content and they are clicking on more internal links to see more pages. So the primary thing is that you have high-quality content and strong interlinking. There are few other things. Now, I will explain everything that helped me in reducing bounce rate on different websites I own. These are some steps which you can follow to reduce bounce rate. Create a proper menu and navigation of your website. Be sure to link all the main pages with good and important content in your menus. Having a top navigation with main pages links is must. If you have added a proper navigation menu on your website, it will be easy to find proper content on your website. Users hate websites where they have nothing to navigate. I personally check the menu of a new website to see what kind of content the website is offering. Menu gives an idea about the content. Readers and visitors are always in search of original content. If your content is original and is written properly, visitors are most likely to stay on the website and also go to another page of your website. This will force visitor to come back on the website again and again. If they will find original content, they will surely share your links with their friends on different social media accounts. Which will surely help you to get some reputation among readers. If you write interesting content, it automatically attracts people to read and share it. You already know that “Content is King.” If you are writing original content, it is good for SEO too. You must Improve the loading time of your blog. I also hate websites which take too much time in loading. I have already written some articles on improving website’s speed. If website loads slow, visitors will surely leave your website without going to any other page. Many visitors hit back button without waiting for loading of the landing page. So, make sure your website loads faster. Google also consider site speed while ranking in mobile search results. You can use website analyzer tools to check what is causing the delay in website loading and then improve your website. If you are using WordPress, start using any good caching plugin. You can also use CDN service to improve the speed. MaxCDN or CloudFlare are few good CDN to start with. Always try to avoid pop-ups and other distractions which cause the problem in viewing your website. Visitors do not like pop ups. Pop-ups irritate visitors while reading the content of your website. Most of the visitors avoid these type of websites. If you are using pop-up ads or pop-under ads, you must stop using it right now. Your visitors will never come back to your website. There are better ways to earn money from the blog without irritating your blog visitors. Affiliate marketing is another best way to monetize your blog and earn huge income. Good interlinking of website means, you can easily tell visitors about other contents and posts of your website. You can use WordPress tag links and category links plugins. There are some other plugins also available which allow bloggers to find and add some interlinks to other related posts on the blog. But I recommend you to do it manually. You can take the example of Wikipedia and learn how to do proper interlinking to get the maximum benefit. You can also see this page and my interlinking pattern. There are many words linking back to my older articles. Try to write small paragraphs and small sentences. Users hate those websites which do not provide readability. If the content is hard to understand, no one is going to read it. Text should be clear on your page. So, take care of background color too. Font size must not be too small or too large. Avoid grammar errors. I recommend the use of Grammarly service. It is available as browser extension, MS word Extension and as an online tool. It helps you in avoiding writing errors and improving your writing. If you are the reader of this blog for long-time, you already know how many mistakes I do while writing. This is the reason I also started using Grammarly. You can read the Grammarly review to have a better idea. Create a search box on your website. So that visitor can easily search content on your website. It is a good way to stop visitors on your website. WordPress provide easy to use widget for search box. If your theme provides it, it is great. You can also create Google custom search for Adsense to earn some money with search. Optimize your error pages and put a good error page with links to your websites home page and other popular posts. It will surely attract some visitors to go on other pages to check your articles. Providing a search box on error pages is also recommended. Most of the people hit back if landed on a error or not found page. By putting interesting content on error page, you can encourage those people to stay on your website and explore your content. If you really want to reduce bounce rate and attract more page views, you must do this. If you are a blogger, use related post and popular post widgets. Visitors often want to have a look at the popular and related posts. It is the most effective way to reduce the bounce rate by engaging website visitors with some other related good posts of your website. In WordPress, many good related posts plugins are available. Other platforms also offer similar kind of widgets. You can also put links to interesting content on the blog posts. See the links I added just below this line. These kinds of links within the blog posts also help. You can use this kind of linking reduce bounce rate of your blog. In your blog post, try to engage readers by asking questions. Most of the people do this at the end of the blog post. If the person was truly reading the article, he will be surely thinking of replying and you will receive a comment. That comment reloads the page and reduces the bounce. The person will also come back to see your reply and you will not just reduce the bounce but also get the engaging reader. 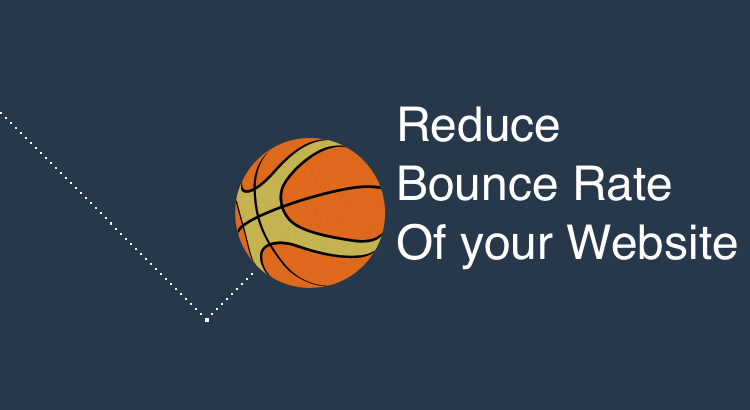 These are some good ways to reduce bounce rate of your website. Follow these ways to enjoy good traffic and reputation among readers. I am sure you will be able to reduce your bounce rate and get more page views. Not all tips work for all because of Niche. So, you have to do experiments and see what is working good on your blog. What do you do to reduce the bounce rate of your website? Share your tips with our readers via comments or guest posts.